After the crude figure review from last time, this time it will be more vanilla, I guess. So another figure review, I’ll try to reach the one post per week pattern again, at the moment it is a bit difficult to find the time for taking pictures and writing depends mainly on my mood. This time Fate Testarossa, the cute, timid loli with a bad childhood is the model of choice. No the figure isn’t based on the illustration but I found this picture cute and quite fitting to add. This figure of Fate Testarossa from the Mahou Shoujo Lyrical Nanoha The Movie 1st was manufactured by Gift and released in the end of June in 2013. Fate is scaled 1/4 and has a height of 27 cm. I often mentioned that I like Nanoha Takamachi quite a lot with her enchanting voice and the kind personality. But oh well, it’s always the same story, whenever I have a favorite character I am so picky that I often can’t decide to get a figure of this certain character. 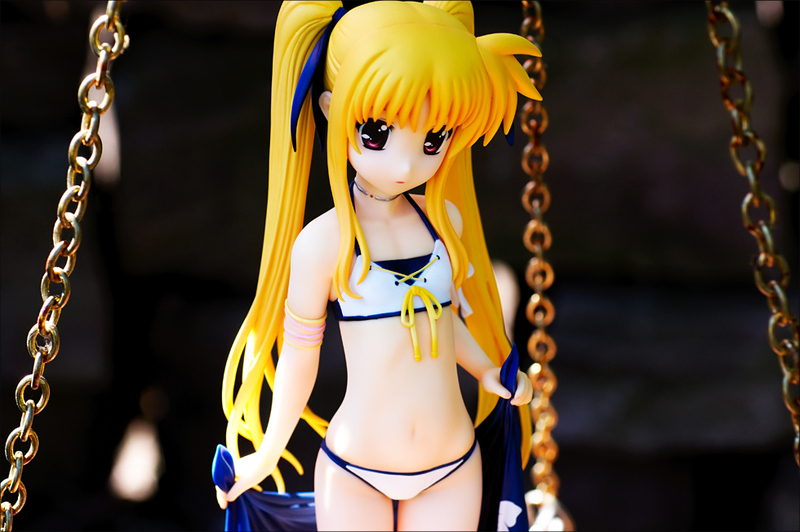 Gift also made a Nanoha figure in Bikini, but I wasn’t that convinced to order her in the end. What convinced me to get the super sized Fate was my general liking for the Mahou Shoujo Lyrical Nanoha anime and a good review from Tier, I found her to be gorgeous and wanted her for myself. Gift often has a little freedom when creating their figures, they often differ from the original source, sometimes this freedom is not to every bodies liking, but sometimes it’s also for the better.Well Fate is close to her anime appearance and resembles my image of Fate very well. Fate is presenting herself in a wonderful twin ponytail hairstyle, decorated by dark blue ribbons. Her hair is very long and has a yellow tone with orange shading. The strands have a nice level of detail and are accurately sculpted, I really like the separation at the ends of her ponytails. What qualifies Fate as a fully fledged loli character is of course her big head in comparison to her body. Even though Gift added no cute blush marks, the face of Fate is very well done, it has a nice shape and this gives Fate a cute expression that fits the characters personality. The figure shows big puppy eyes, a tiny stubs nose and a slightly opened mouth. As little gimmick you can decide to display Fate with her magical device Bardiche in her mouth or without it. 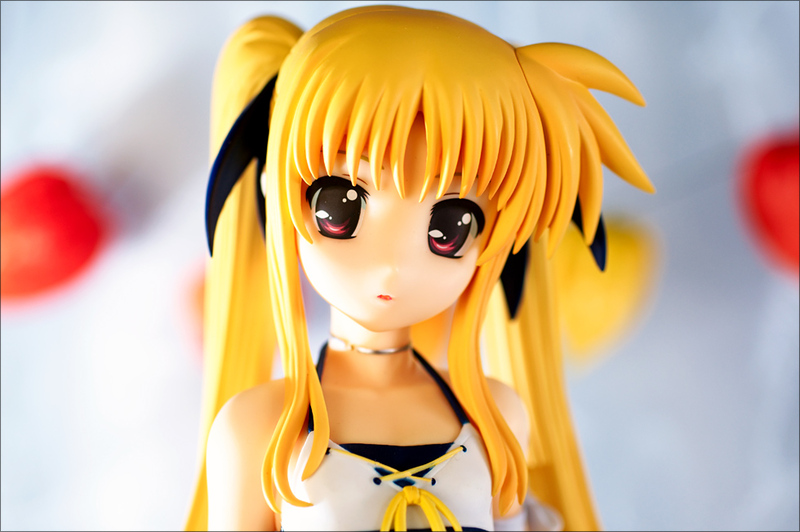 It is no secret that Fate is a rather young girl in Mahou Shoujo Lyrical Nanoha The Movie 1st, but if it weren’t for her big head, Fate could also be a slender, yet older teenager girl. A teenager girl with a flat chest of course. Anyway, Fate’s body looks really good from the front or the back there are some nice highlights like her detailed back with the scapulars or her lower back. The transition from hips to thighs is also very well done. The legs have a well balanced length, they are not too long and not too short. The sculpting of the whole body is especially smooth. I can’t really remember a scene in the Movie where Fate was wearing a bikini, but that doesn’t really matter. Her outfit consists of a two piece bikini in white at the front and dark blue at back. With the two layers and the laces at the front her top has a cute, sporty design. The slip is rather tiny and skin revealing, to create the effect of the fabric’s stretchyness there is lighter shading at the part that covers her buttocks. There are some realistic wrinkles at the front and the back, from a lower angle you can notice a detail you wouldn’t expect from a loli figure. 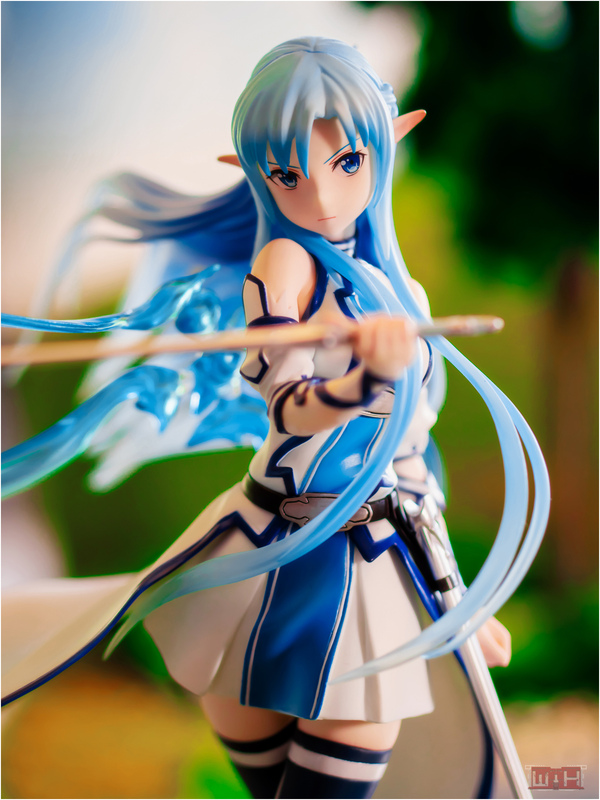 To have more stuff to dress her and to have an additional item, the figure comes with a Parero. It has to be placed with a little force in both hands, but its worth the effort. It goes very well with Fate and has a nice design with wrinkles and a printed on hibiscus pattern. Smaller details are also part of the figure, there is silver necklace, different colored bands and a white ribbon wrapped around her arms. There is also a tiny footchain and blue beach sandals. The pose of her is nothing special, but it creates a fitting mood and convincing pose of Fate in a beach like scenario, I’m actually a fan of such simpler, standing straight poses. This is also something I really like about the upcoming Sonico – Package version from Orchid Seed. It seems like Fate wants to close or eventually open her parero, to have both hands free she put Bardiche in her mouth while walking towards the beach restaurant. I love these smaller details about the pose, like placement of her arms or the nicely tilted head. The base is a simple shiny white disk with a small diameter that connects to her feet, it will win no beauty contest but gives the figure a secure stand without grabbing away much attention from the figure. I never expected to buy an 1/4 scaled figure before since it seems a little too big, but Fate is actually not taller than an adult 1/6 scale figure, only the head is far bigger in comparison. Large scale figures can actually be very charming, even from a distance you can examine every nice bit of the figure, which is especially true for the face. Fate has such a nice face, I love it. The figure offers an interestingly designed bikini and a fantastic body sculpting. Oh this actually my first figure from Gift, well their quality is very high, there are no unnecessary seam lines or flaws in the hair, also the paintjob is nice and clean. I paid 9670 Yen for Fate and chose registered SAL, worth of 3050 Yen for shipping, nevertheless I’m really happy about the purchase of this figure. Too bad Exilehero did not get her, would have been nice to make a dual review with both Gift Nanoha and Fate. I like this figure, very Fate like, I always love that Fate is very demure her swimsuit figures are never out of character. Yes, such a cheapskate, her price even dropped to less than a half, recently, maybe I’ll get Hayate,as well. Fate looks quite charming with her demure and cute appearance, she has a little more adult presence than happ, happy Nanoha. Aaah, Fate is always lovely and beautiful and cute. Freeing did a great job on her face, though I wish that seam line around her side-puff wasn’t so obvious. Her parero makes up for it though. I’m still trying to resist her, but your review is making it harder. Her large scale stops me from picking her up (she would look so out of place among my 1/8 and 1/7 figures), but I would definitely consider her if I find her for a good price. I’m just afraid if I get her, I’ll have to pick up Nanoha and Hayate as well. Darn my set mentality! 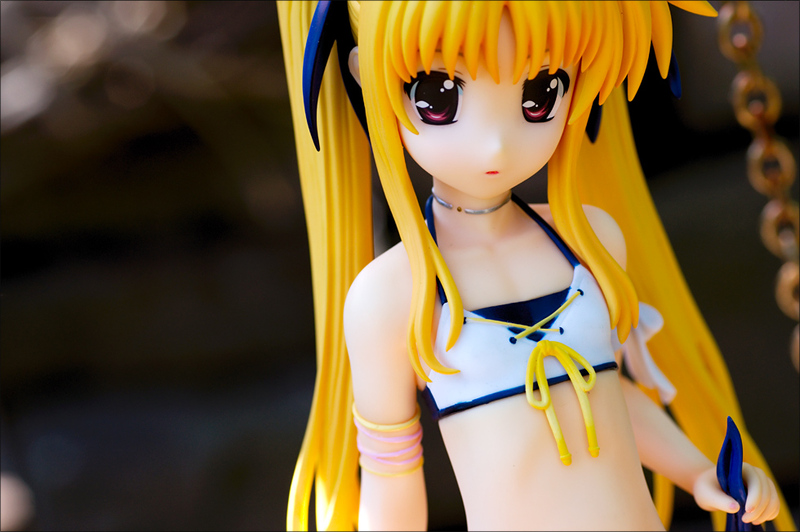 That being said, I wish Hayate got more figures. She’s my favourite. Fate is a good girl and turned out very adorable as big scale figure. Actually all the 1/4 scale figures are from Gift, the big bunny suit figures are from Freeing. Hayate is lovely, have you seen how energetic and cheerful she is? maybe I’ll get her as well. 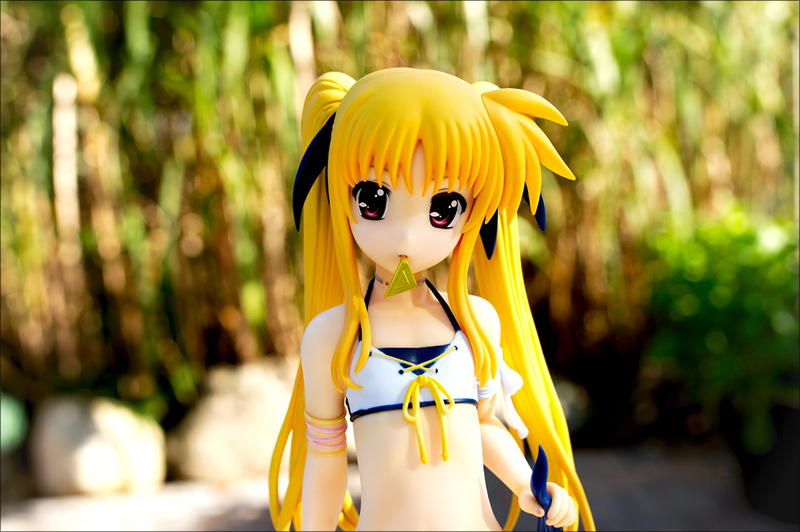 I only dislike the Nanoha figure from Gift, she’s my fsavorite character but I don’t like the figure. Oh you like Hayate the most, thats a bit rare, I found her quie charming in season two. It’s a pretty Fate figure, for sure, I love all her cuteness and she is really big. Thank you very much =D Yeah these outdoor shots were from, where it was still warm and sunny, I already miss the past season. 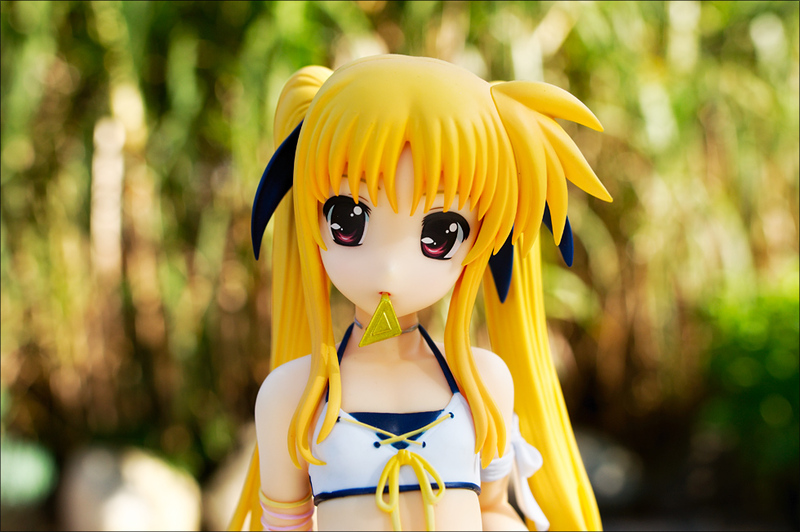 I am only familiar with the Nanoha girls due to the large volume of figures that get cranked out every few months but I do like the Hayate character designs (adult and loli) in the 1/4 swimsuit ver figures far more than either Fate or Nanoha. I don’t own any of the their figures but thought it was funny since both Fate and Nanoha seem to be the Naruto and Sasuke of the series. Each with a dedicated army of fanboys willing to go to bat for their respective favorite. Am I close or is Hayate just as loved as the others? Also, great pictures and I’m very happy to hear that you’ll be trying for once a week with the reviews. thx for your comment. Not sure if this will suit your tastes, but the two movies would give you a good overview about it, it are good anime movies. I just checked the loli version of Hayate and I agreee that she’s a little more adorable, even though I like my Fate, she’s presented not too hyper and not too timid. I don’t know about Japan, but in the west Hayate is not that popular, I think it’s because she wasn’t present in the first season. Yeah I should keep this pace, even though it is not always easy to do. Hey you would be proid of Sayaka as well ;p Fate is really nice, her size makes her even more adorable, I would say. She’s a really cute figure, moreso because she’s such a large figure. There’s something about a gigantic loli figure that really catches the eye. The question for me is whether I want to get Hayate, too; she’s also very cute. These three girls must buy their swimsuits from the same place. Before I got my own Fate I though “man what does the dude do with his increasing number of 1/4 figures” Now I understand their appeal better. Fate in her bigger size is very charming and more hug able (ok that sounds weird) than the smaller figures. I’ll pay more attention to larger scale figures. I think Hayate is also cute, wow I never saw this version of her kawaii, such a pretty face and she’s so cheerful overall.